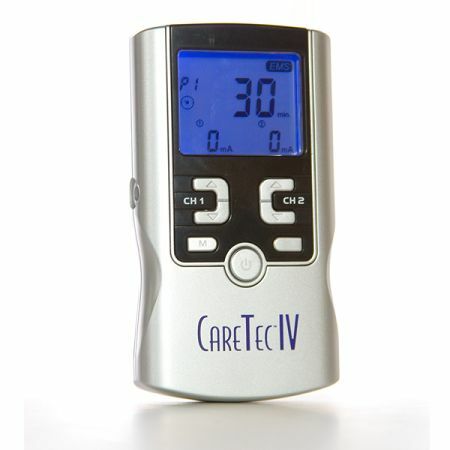 The CareTec IV Electrical Stimulator is a portable electrotherapy device featuring FOUR therapeutic modes: Transcutaneous Electrical Nerve Stimulation (TENS), Electrical Muscle Stimulation (EMS), Interferential (IF), and Russian Stim, which are used for pain relief and muscle stimulation. The stimulator sends a gentle electrical current to underlying nerves or muscles via electrodes applied to the skin. The parameters of the device are controlled by the channel buttons, with the intensity levels easily adjustable according to a user's specific needs. Relieve your pain with TENS. TENS stands for Transcutaneous Electrical Nerve Stimulation and is a non-invasive, drug-free method of controlling pain through small electrical impulses. These impulses mask the pain in the treated area and help you carry out daily activities pain free. Therapy stimulation for your muscles in the EMS program. EMS, or NMES, is Electrical Muscle Stimulation designed to help treat muscle injuries. This program’s function is to cause muscle contractions in efforts of helping rehab the muscle tissues, along with directly working on muscle motor neurons. This therapy is popular for all muscle-related injuries, muscle re-education, and improving blood flow to the muscle groups. Reduce Chronic Pain & Inflammation with the IF program. Interferential Stimulation or better known for short as (IF) is a chronic pain therapy & anti-inflammatory-based treatment modality. Interferential stimulation provides powerful and deep stimulation by using two alternating-currents of different frequencies that work together to produce an interferential current. This current has been proven to stimulate sensory, motor, and pain fibers offering chronic pain relief where TENS may not be strong enough. Strengthen your muscles and alleviate spasms using the Russian Stim program. Russian stimulation is commonly used to assist a muscle in strengthening more quickly following injury or surgery. It uses medium frequencies to provide electrical stimulation to muscle groups and can also be used to reduce muscle spasms, as well as for muscle strengthening. Russian Stimulation is an integral part of rehabilitation and healing for many patients. Pulse Amplitude: Adjustable, 0-100mA peak at 1000 ohm Load each channel, 1mA/Step. Pulse Width: Adjustable, from 50-300µS microseconds, 10µSec/Step. Pulse Amplitude: Adjustable, 0-70mA peak to peak at 1000 ohm Load each channel, 1mA/Step. Interference Frequency: 1 to 150 Hz. Pros: Relieves the pain very well. Good price (value) - cheaper than competition. Free Shipping. Free AC adapter. Fairly well constructed - dropped mine a few times on carpeted floor with no problems - still works. Cons: Buttons hard to push. Not for the elderly that have arthritis in hands as buttons need to be pressed forcefully to change settings. Buttons are hard (noisy)click rather than a soft touch/press. Cannot disable annoying beeps when buttons pressed. Cannot make adjustments in church services or theaters as it is much too loud when you change settings (read as beep, beep, beep every time you press a button). Wish this unit was a hybrid digital/analog controlled unit so that you can dial in more accurate sensitivity settings. Learning curve is rather steep with this product and I have two college degrees. Takes about 3 weeks to figure out all the ins and outs of the settings. I like the unit---it's versatile, easy to figure out, and works as designed. The pocket/belt clip needs to be made of spring steel for function and durability, rather than cheap plastic. The beep of the buttons should be able to be muted. besides these two items, it's a great unit, well worth the money! Great value. I bought another similar unit but it did not have the Russian Setting. Compact and easy to use although the manual could be improved greatly to help you understand the different settings and to use it to it's maximum. Should have a metal clip rather than the plastic one that doesn't hold well. Beeping needs to be muted, it's annoying. All around, good machine. I bought this for muscle soreness and stiffness. I have a small TENS that has a few preset cycles and minimal intensity adjustment. I like that this one is completely user set. The intensity is great too. Some settings are too high! There is a bit of a learning curve when it comes to adjusting the various settings and getting the level of stimulation you want. The instructions are detailed but plainly academic. The only con I have is that EVERY button press makes a loud beep. Other reviews have written about the same complaint. I opened mine up on day 2 and snipped the speaker wires. This product does exactly what it claims it can do. Make sure the right size pads are used according to the instructions that come with the unit. This is an outstanding tens unit with 4 different settings; I love the IF setting. I am very happy with how strong I have the ability to turn the setting up. 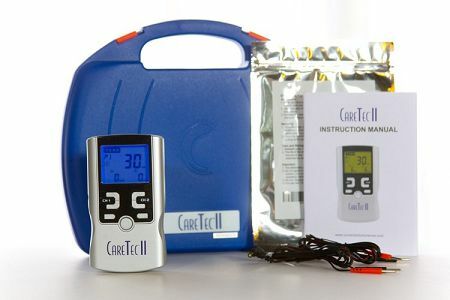 This system is easy to use and does an exceptional job of pain relief. My physical therapist wanted to know where it was purchased and commented that it was comparable to, and in some ways superior to, the one he uses in his practice. I love it! This unit works well and I use it often....Having the various types of stimulation on one device is a blessing . My spinal doctor said to use them allrandomly to keep the errant muscles confused. The only downside to this unit is it uses batteries at a very fast rate. I use rechargeable ones but I have to have a lot of them ready. I usually use this device while watvhing t tv. I have another device that is only battery operated TENS which I use when I need to be mobile... All in all this device is great. This little gem keeps me fascinated by the various modes and custom settings of operation possible. I derive positive effects that mitigate my pain and suffering and for that I give the device a high rating. In my opinion this device will fulfill the needs of many people who suffer from various causes of physical pain and discomfort. Great equipment. Love it. Works for all levels of pain issues. highly recommended, I use this item as part of my home routine for PT. i follow what the PT does and the different regiments and it works. i have already recommended this item to a friend who also is recouping from an ACL surgery. Good. I like it. Shipping was good. Very easy to use and has enough power to help with the fibromyalgia pain and muscle tension. I wish there was a way to turn off the beeping sound it makes every time a button is pushed. Other than that I am very satisfied with this product. My physical therapist recommended this unit. It works to relieve muscle tension. I think it helps a lot. Easy to use. Best to plug it in. 9v battery only lasts through 2 30 minute sessions. Q: Does "continuous" mean that this unit will stay on, until I shut it off? 12 - 24 hours? The "Continuous" timer setting will have the device run until either you physically power it off, or until the battery dies.